With apologies to those who follow my photo submissions – I know Facebook, Twitter, and Instagram followers see my photos as a matter of course, but WordPress and email subscribers probably don’t, due to a quirk of what gets pushed and how. This week I’ve been advertising flowers, and the berries they will produce! Thought I’d share a little more on that, since it’s early May, and many of the berry plants we’ll be searching for later this summer are blooming – I like to take note NOW, so that when things ripen up later in the year, I can beat the birds and other animals to at least some of them. 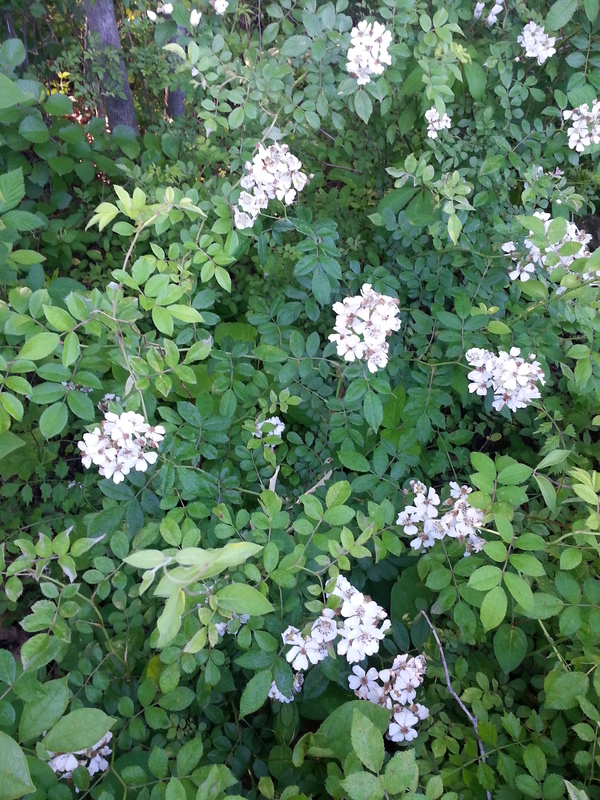 “Huckleberry” means different things in different regions, but basically refers to a set of wild blueberry species that produce bell-shaped white flowers like this in May, and then each flower produces a single berry sometime between June and August, depending on specific species, climate and soil conditions. The berries range from dark red through blue to a deep almost-black glossy purple, and taste anywhere from tart like a cranberry, through blueberry sweet. The bushes are about 2 feet high, with slightly pointed oval leaves about 2-2.5″ long. Fortunately, my back yard is full of them – the understory is mostly holly and huckleberry! Wild berry pancakes are in my future! Blackberries are a bramble, a thorny, weedy plant that loves waste ground – sunny overgrown fields, fence rows, roadsides. Right now you can see splashes of color – little white to pink, five-petaled flowers with a mess of spots and pink stamens in the middle. The flowers (and later berries) grow in clusters from one stem, and the plants are like the ones in this picture, often shouldering their way through other plants, draped over other bushes, and generally mingled with something non-blackberry. Come back in late June to mid-July, and there will be a treat here, if the birds don’t get there first! (aka Tulip Poplar or Tulip Tree) I’ve been surprised to learn how many people don’t know what these are. They are the big showy flowers of the Tulip Tree, aka Tulip Poplar, or Yellow Poplar. And no you can’t eat them, but they’re out now and I just thought I’d throw them in the mix. The trees are blooming now, but the flowers only tend to show up on parts of the tree with access to direct sunlight. So unless you have a big leafy poplar at the edge of a clearing (not common), all the flowers are high in the canopy, and you don’t see them until wind breaks them loose or the spent petals break off and come down one by one.